This Scientific Literature Page is organized into a group of brief topic summaries followed by detailed lists of scientific references. Reviews on Wildlife *Newest Articles All Species Review Articles Wildlife Books *Amphibians *Bacteria and Fungi, *Bats *Bees and Insects Birds *Cell Towers *Fish *Government Letters and Papers *Magneto-reception *Mammals *Non-Thermal Effects *Plants and Seeds *Reptiles *Trees. A diverse array of animal life relies upon the earth’s magnetic field for navigation, breeding, feeding, migration and survival. Biologists have discovered that wireless electromagnetic radiation disturbs internal magneto-receptors used for navigation, as well as disrupting other complex cellular and biologic processes in mammals, birds, fish, insects, trees, plants, seeds and bacteria with profound impacts on the natural environment. Different species have different interactions with radiofrequency radiation (RFR) and differ in their toxic effect. These effects may not be immediately apparent with a slow decline in the health of wildlife seen over time with cumulative exposure. The European Commissions Scientific Committee on Health and Environmental Emerging Risks (SCHEER) in 2018 issued their emerging risks report . They listed 5G electromagnetic radiation as an emerging risk due to it’s effects on wildlife. They pointed to a recent article “5G wireless telecommunications expansion: Public health and environmental implications. (2018) by Russell CL in Environmental Research. Other important research includes Dr. Martin Pall’s articles 5G: Great Risk for EU and Wi-Fi is an important threat to human health. Adverse responses from radiofrequency radiation that have been identified include abnormal behavior, developmental abnormalities, diminished reproduction and increased mortality. Birds, bees, turtles, dolphins, salamanders, salmon, amphibians and other animals use the earth’s weak magnetic field and their own internal magneto-receptors to navigate. Birds have feathers that can act as antenna and amplify the negative effects of RF radiation Bigu-del-Blanco (1975). Insects, the base of the food chain, appear particularly susceptible to radiofrequency radiation, especially 5G millimeter wavelengths which are the size of the insect and create a damaging resonance effect. Mammals, like humans, have similar reproductive organs, immune systems and nervous systems, thus are susceptible to molecular and cellular harm from artificial wireless radiofrequency wavelengths. Katie Singer, in her extensively referenced book Electronic Silent Spring, highlights that the earths living systems evolved their own internal and external signaling systems in the presence of the earth’s low electromagnetic environment and thus are vulnerable to the much higher levels of artificial pulsed electromagnetic radiation experienced today. Stationary cell and radio towers create a circle of high power wireless radiation (1500 feet) around them, with a much larger radius (dozens of miles) of lower power radiation, which scientists have found can contribute to environmental disturbances. In cities the density is much higher with more towers and co-location of multiple antennas on a single tower to accommodate multiple telecommunication carriers. Firstenberg (2017) in his fascinating and well-researched book, The Invisible Rainbow: A History of Electricity and Life, describes both observations and biological experiments performed, mostly in Europe, where radio broadcast towers caused not only human symptoms but also affected widespread forest health with loss of birds, thinner growth rings on trees, poor seed germination and loss of duckweed, among other effects. When these towers were removed, not only did local residents symptoms disappear, the forest recovered. The Skrunda Radio Location Case. In Colorado, Aspen trees have been on the decline and experiments have pointed to radiation from cell towers causing poor growth and smaller leaves- Haggerty 2010 A 4-year experiment by Waldmann-Selsam et al (2016) clearly demonstrated, with accurate RF emission testing, cell tower radiation causing the death of nearby trees over time. He notes, “These results are consistent with the fact that damage afflicted on trees by mobile phone towers usually start on one side, extending to the whole tree over time.” These are truly alarming findings and serve as a dire warning on further wireless expansion, especially with regards to agricultural rural zones or wildlife areas with sensitive species. Research also raises the question of wildfires sparked by dead or dying trees near cell towers. Numerous studies on plants, bacteria and fungi have shown adverse or enhanced growth patterns with exposure to varying levels of microwave radiation. We do not consider the influence of RF on infections in animals, humans or plants. and how this alters patterns of human and plant infectious diseases. Among the research, a recent project of the California Science and Engineering Science Fair by Joshi and Omer compared the effects of UVR versus radio frequency radiation (RFR) on lima beans, basil seeds and yeast. They found that RFR reduced growth of lima beans, increased the growth of yeast and had no effect on Basil. On the other hand UV light increased the growth of lima beans and basil but did not affect yeast. Biologists have noted that birds magnetic compass orientation appears more susceptible to weak broadband electromagnetic fields. Schwarze et al (2016), note in their paper that weak magnetic fields can have much more powerful influence on bird migration than strong fields. They state, “Our results indicated that the magnetic compass orientation of European robins could not be disrupted by any of the relatively strong narrow-band electromagnetic fields employed here, but that the weak broadband field very efficiently disrupted their orientation” Pakhomov (2017) and Wiltschko (2015) both confirmed this effect. It is well established that magnetite, a form of iron ore, is found in a wide variety of organisms who use this magneto-receptor to sense the earth’s low energy magnetic field as a directional reference. (Cadiou and McNaughton). Magnetite acts as an internal compass of sorts. Migrating birds, fish, insects and animals connect these magneto-receptors with the earth’s natural geomagnetic forces, to successfully guide them in long and short distance journeys, necessary for feeding and breeding. Modern communications systems with a proliferation of cell towers and smart meters in cities and rural areas, create a fluctuating blanket of continuous pulsating artificial radiofrequency wave mixtures that can alter local magnetic fields and thus impair migration and orientation of birds in addition to effects on pollinators. In 1998, soon after cell towers were installed in Pennsylvania, pigeon races ended in disaster as up to 90% of birds were disoriented and lost their navigational skills. When Homing Pigeons Don’t Go Home Again NY Times. Dec 6, 1998. Independently replicated studies have confirmed the radio frequency (RFR) effects on orientation of birds. Engles et al (2014) exposed migratory European robins to background electromagnetic noise present in unscreened wooden huts at the University of Oldenburg city campus in Germany and found they could not orient using their magnetic compass. If grounded their orientation reappeared but disappeared again if broadband radiofrequencies were generated inside the huts. He did not believe the effects at first and performed the same double-blinded study many times in 7 years and with different graduate students to confirm the effect before publishing his findings. Dr. Engles concluded, “The disruptive effect of radiofrequency electromagnetic fields is not confined to a narrow frequency band and birds tested far from sources of electromagnetic noise required no screening to orient with their magnetic compass.” Research has also demonstrated abnormalities in reproduction and behavior of birds nesting near cell towers in addition to harm to amphibians. This raises the question of the health and sustainability of cites with a dense assortment of telecommunications towers. Bees are a critical pollinator species. Of the 100 crops that provide 90% of the world’s food supply, 71 are pollinated by bees, according to the UN Environmental Program. Researchers agree that we are in the midst of a pollinator crisis. The White House in 2014 was so concerned it established a Federal Strategy with a Pollinator Task Force to promote bee health. As bee numbers have plummeted around the world, scientists have been investigating causes. They have found several contributing factors affecting the health and reproduction of bees, including pesticides, global climate change, loss of habitat and air pollution with new research pointing towards microwave radiation as an important and yet unrecognized cause for concern. Bees contain magnetite granules in their abdomen which offer them the ability to navigate with the earths natural low power non-pulsating magnetic field. 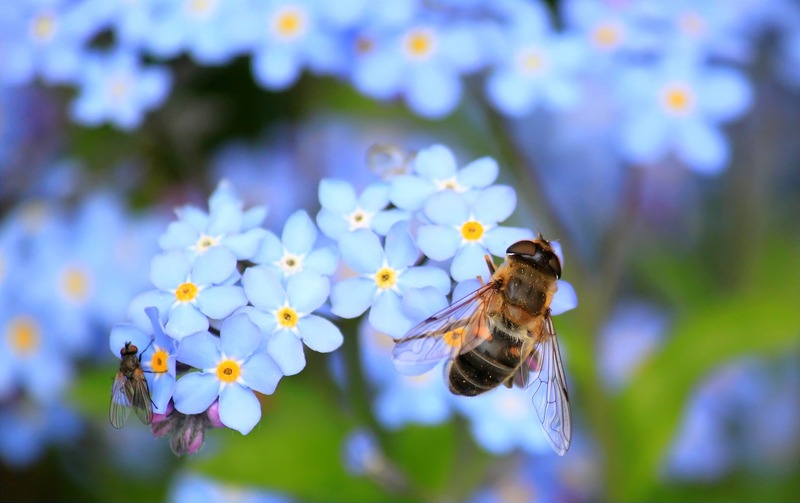 Bees operate in about a 5 kilometer radius and typically find their way without difficulty. Sharma et al (2010) looked at bee behavior placing a cell phone near a hive. They found worker bees returned less and less frequently to the beehive after the installation of a mobile phone. There was a significant decline in colony strength and the rate of queen egg laying. Kumar et al (2011) looked at physiologic changes in bees exposed to cell phone radiation and found it creates a stress response, increased agitation and increase in carbohydrate metabolism. Favre et al (2017) clearly demonstrated that bee behavior is disrupted by exposure to cell phone GSM radiofrequency radiation and caused worker bees to emit a piping signal to swarm. Bees have also demonstrated aggression after 30 minutes of cell phone exposure. Dr. Favre notes, “Mobile phone companies and policy makers point to studies with contradictory results.” However, his study distinctly demonstrated adverse effects. He invites others to reproduce his research. Cammaerts (2017), biologist and author of 54 peer reviewed publications on insects, observes that the sharp decline of bees did not start with the use of insecticides but much later and removal of pesticides has not been accompanied by the expected rise in bee populations. While she does not discount a role for insecticides causing bee decline, she advises beekeepers to consider that radiofrequency radiation could also have an impact and protect their hives by locating these in a low EMF environment or placing them in a Faraday cage or enclosure. Bees are not the only insects necessary for sustainability and all are suffering decline. Purdue University among others points out that insects are critical in living ecosystems. They are wild and domestic pollinators, provide a source of food for amphibians, reptiles, birds and mammals, are primary decomposers for fungi, dead plants and animals and also eat other pest insects thus playing a beneficial role in the balance of nature. A Yale report in 2016 highlighted a dramatic drop in insect populations in many parts of the world. Insect traps set up in Germany are showing a startling 4 to 5 fold reduction. Biologists attribute this to monoculture farming, pesticides and habitat loss, however the scientific literature points to radiofrequency radiation as another significant contributing cause. Yale report on insect decline. The increase the number and density of cell towers in cities and rural areas coincides with insect and bird decline. Older generation technology emits RF frequencies between 100 MHz and 6 GHz with wavelengths in inches to feet. A new 5th generation (5G) of wireless communications is being proposed, adding to the mix millimeter waves (fractions of an inch long) between 6 GHz to over 100 GHz. These high frequency wavelengths pulse at billions of cycles per second (1GHz=1 billion cycles per second). Radiofrequency wavelengths, especially those that are modulated (or pulsed) are known to cause much more disruption to organisms, or structures within the organism, if the frequency wavelength is the same size as the organism, organ structure, cell or cell structure. This phenomenon is called resonance. It leads to heightened vibration and thus injury. Insects are smaller in size and close to the width of 5G frequencies. Thielens (2018) studied this effect on 4 different insects exposed to electromagnetic fields from 2 to 120 GHz. He found “The insects show a maximum in absorbed radio frequency power at wavelengths that are comparable to their body size…..This could lead to changes in insect behaviour, physiology, and morphology over time due to an increase in body temperatures, from dielectric heating.” Insects are thus especially susceptible to 5G microwave frequencies. There has been no premarket testing of this 5G technology however a body of research demonstrates harm to insects. Policies to expand deployment of this technology unfortunately do not consider these biological or environmental effects. Magras and Xenos (1997) performed an in-vivo study looking at prolonged exposure to low intensity radio frequency radiation and reproduction. They used 12 pairs of mice, placing them in various areas in an antenna park in a small mountaintop village in Greece near TV and FM broadcast transmitters. The animals lived in this area for 6 months with levels below well below CENELEC and IEEE standards. 6 pairs of animals were used as a control and placed in an environment free from RF radiation, about 10 KM from the town of Chortiatis, where the antennas were located. He notes, “Mice from the BALB/c/f breeding colony obtained from the ‘‘Theageneion Anticancer Institute of Thessaloniki’’ have been used for years in our laboratory for reproduction. Repeated pregnancies with a recovery period of 1 – 4 weeks for over a year, had never affected the fertility of the dams or any morphological parameters of the offspring, a fact that to our knowledge has not been questioned in the available literature.” Their study showed a progressive reduction in litter size in the exposed female animals to the point of irreversible sterility by the 5th generation. The males exhibited rough hair and emaciation at the end of the study. The NIEHS National Toxicology Program on Cell Phones and Cancer released their results in 2018 looking at non-thermal effects of cell phone non-ionizing radiation. They showed consistent perinatal effects, including lower pup body weights and lower pup survival. The NTP study, at https://ntp.niehs.nih.gov/ntp/about_ntp/trpanel/2018/march/tr595peerdraft.pdf , also noted clear evidence of heart tumors, a statistically significant increase in brain tumors and adrenal gland tumors, as well as DNA damage and cardiomyopathy similar to aging. An abundance of in vitro studies in animals shows that non-ionizing radiation can damage reproduction by creating a stress response in cells producing damaging reactive oxygen species. See also Physicians for Safe Technology Reproductive Health Effects Scientific Literature. Several studies indicate that low power non-ionizing microwave radiation contributes to and can cause cataracts. Heat is a well-established mechanism for induction of cataracts as the lens does not have vessels that can dissipate heat. Non-thermal effects however have also been demonstrated in some research, which show adverse effects on lens transparency, alteration of epithelial cell proliferation and apoptosis, and a stress response in lens epithelial cells. Damage to lens epithelial cells is associated with cataracts. Hassig et al (2009) investigated in Swiss calves the prevalence of nuclear cataract near mobile phone base stations. They found (32 %) of the calves had various degrees of nuclear cataract. The number of antennas within 100 to 199 meters was associated with oxidative stress and there was an association between oxidative stress and the distance to the nearest mobile phone base station. In a later study, Hassig et al (2012) looked at the incidence of cataracts in newborn calves before and after a mobile phone cell tower was placed and found a 3.5 times higher rate of significant cataract after the mobile phone station was installed. Tagging animals for tracking is an important tool to help researchers understand their behavior, habitat selection and migration patterns. Some studies have indicated no harm from these tracking devices, however, other studies show lowered survival rates and reproductive rates. There may be a direct interference in the behavior of the animal due to discomfort as well as direct harm from the continuous pulsing radiofrequency which is located on the body, as a growing body of science demonstrates. Balmori (2016) warns, “It is paradoxical that, at the same time, field scientists investigating the movements and other aspects of animal biology are providing animals with radio transmitters that emit the same type of radiation, since this may affect the results concerning their orientation and movement.” There is also concern with regards to successful reproduction and animal behavior with close proximity to RF radiation. The US Fish and Wildlife Service and the Department of Interior (DOI) has had concerns for many years about the adverse impacts of cell towers and electromagnetic radiation on migratory birds and other wildlife. It is conservatively estimated that 4 to 5 million birds die each year in cell tower and guy-wire collisions. (Government- Manville 2005, 2009). The DOI noted that there were 241 species of birds whose populations merit special protection. Balmori has documented wildlife effects after cell towers were constructed including nest and site abandonment, plumage deterioration, locomotion problems, and death in House Sparrows, White Storks, Rock Doves, Magpies, Collared Doves, and other species. Robotic Bees: “Smart” or Dumb Pollination? Are we creating dead zones in cities where urban or rural farmers will not be able to grow food or have a vegetable garden? The tech industry may advise us to use the very technology that is harming ecosystems by using bee drones to pollinate our crops. Walmart has already filed a patent for a pollinating robotic bee. What about ownership of drones, privacy, security and adverse effects on sensitive native bees and flowers with the use of these drones? Many questions, no answers but predictable untoward results. Will the situation worsen? Solving the real problems causing the decline of species seems smarter than always trying to develop a new and potentially more toxic industry to fix it. Patients are often given prescriptions to treat the numerous chronic diseases of our modern culture. These medications can cause side effects that may be far worse than the disease. Physicians now understand it is often more sensible and effective to help patients change their diet, add exercise and avoid toxic exposures to promote health and prevent disease. Wireless radiation is another toxic exposure with measurable biological effects. Should we not approach wireless technology with the same preventative precautions as we do pesticides, industrial chemicals and ionizing radiation? What are Safe Levels of RF Radiation? Sage, Carpenter, Blank and other scientists note in the Bioinitiative Report that non-thermal bioeffects are clearly established. There is an urgent need for government agencies to adopt a realistic biologically based exposure standard to replace the thermal (SAR) standard, which is far too permissive and not protective of human or environmental health. The Bioinitiative Report reviewed studies looking at the lowest levels of non-thermal, non-ionizing radiofrequency that did not cause harmful biological effects. Their conclusions, based on peer reviewed research, indicated that there should be a “ scientific benchmark of 0.003 uW/cm2 or three nanowatts per centimeter squared for ‘lowest observed effect level’ for RFR is based on mobile phone base station-level studies.” They also suggest “Applying a ten-fold reduction to compensate for the lack of long-term exposure (to provide a safety buffer for chronic exposure, if needed) or for children as a sensitive subpopulation…”. This translates into a recommended precautionary action exposure level of 0.0003 uW/cm2. Our current U.S. guidelines are regulated by the Federal Communications Commission (FCC) and they follow that of the American National Standards Institute (ANSI), the Institute of Electrical and Electronics Engineers, Inc. (IEEE),and the National Council on Radiation Protection and Measurements (NCRP). Their guidelines are from 200 uW/cm2 to 1000 uW/cm2 (2 W/m2 to 10 W/m2 ) for RF radiation depending on frequency. Blake Levitt, an award-winning medical and science journalist and former New York Times contributor is author of Cell Towers-Wireless Convenience? or Environmental Hazard? (2011), from “Cell Towers Forum: State of the Science/State of the law” environmental conference December 2, 2000. Her book was updated in 2011 and has valuable information on FCC safety guidelines, legal aspects of the Telecommunications Act, cell tower sitings and case law. An article she and esteemed researcher Henry Lai have written provides a meticulous review on environmental effects of cell towers as well as basic information on terminology and exposure limits. Human survival depends on biodiversity with complex interrelated ecosystems from bacteria to bees to birds to trees to earthworms for a healthy functioning environment. Maintaining clean air, clean water and sustainable soils with naturally evolved organisms is vital. The environment is our “Natural Capital”. It appears now under threat from the proliferation of radiofrequency towers along with habitat loss and exposure to other environmental toxins such as pesticides and industrial chemicals. It is critical to consider the adverse effects of the proposed expansion of wireless telecommunications towers and lower atmospheric balloons in cities and rural areas before they are deployed. Like sonic threats sonic threats for marine mammals the hazards are not seen, heard or felt by humans with harm to animals slow to be realized. Consideration should be given to relocating antennas away from sensitive wildlife habitats, agricultural zones/farms, residential, school and hospital zones where people live and work. Converting wireless broadband to fiberoptic cabled systems is safer and more sustainable in both cities and rural areas. Panagopoulos (2013) explains in his review of experimental data, how living organisms are in harmony with terrestrial and magnetic fields, which effect their cellular processes and even circadian rhythms. Interference of this delicate interaction with human wireless technology can adversely affect the health and well-being of ecosystems. MOBILE TELEPHONY RADIATION EFFECTS ON LIVING ORGANISMS. Dimitris J. Panagopoulos and Lukas H. Margaritas.Department of Cell Biology and Biophysics, Faculty of Biology, University of Athens, Greece. The Invisible Rainbow: A History of Electricity and Life. Arthur Firstenberg . AGB Press. (2017). The Body Electric: Electromagnetism and the Foundation of Life. (1985) Robert O Becker . Harper Paperbacks. Magnetic Orientation In Birds . (1996). Wiltschko W. and R. Wiltschko The Journal of Experimental Biology 199, 29–38 (1996). Cognitive impairment in rats after long-term exposure to GSM-900 mobile phone radiation. (2008) Nittby H et al. Bioelectromagnetics 29: 219-232: 2008. https://www.ncbi.nlm.nih.gov/pubmed/18044737 Summary: This study showed cognitive impairment in rats after long-term exposure to PM MW radiation. This is study of rats shows that after 2 hours per week for 55 weeks there was impaired memory for objects in exposed as compared to sham animals. Radiofrequency radiation injures trees around mobile phone base stations. (2016) Waldmann-Selsam C. Sci Total Environ. 2016 Dec 1;572:554-569. https://www.ncbi.nlm.nih.gov/pubmed/27552133. Damage from Chronic High Frequency Exposure; Mobile Telecommunications, WiFi, Radar, Radio Relay Systems, Terrestrial Radio, TV, etc. First Symposium; The effect of electromagnetic radiation on trees, The Groene Paviljoen, Baarn. PowerPoint presentation. (2011) Volker S. Ing. Dipl. Phys. 18.2011.